The sole value of a college degree may be in how it “positions you better in the job market” even if you learned very little from your time in school. All that the favorable job statistics for college graduates tell us is that having a degree positions you better in the job market compared with people who do not have those credentials…. A college degree is a credential used for screening out job applicants. … Many employers who need workers for jobs that require only basic abilities and a decent attitude now screen out people who don’t have college degrees. Companies looking to hire for positions such as sales supervisor and rental car agent, for instance, often state that they’ll only consider applicants who’ve graduated from college. What they studied or how well they did is largely beside the point. How much college graduates learned is often beside the point. The individual who studies, say, chemical engineering and thereby acquires the essential background for a career in that field probably gets a splendid return on the time and money spent on college. But on the other hand, the individual who leaves high school with weak skills and scant interest in academic work, enrolls in school with low standards (perhaps a “party school”), chooses an easy major and breezes along to a degree four or five years later is likely to end up working in a low-skill job that an intelligent high schooler could do. That person, even though employed, is getting a negligible return—possibly even negative—on his college investment. George Leef, ‘Jobs data cannot prove that college is a “good investment”‘, The John William Pope Center, February 25, 2015. Has a college education become a very expensive and less meaningful entitlement? Due to government subsidies and cheerleading about the supposed benefits of additional years of formal schooling, over the last 50 years we have transformed higher education. What had formerly been a rather inexpensive service that a small percentage of the populace thought worth striving for has been transformed into a very expensive one that’s now widely regarded as an entitlement. Thanks to government “help,” the cost of college has soared, but at the same time, academic standards have eroded and at many institutions, the curriculum has turned into a hodge-podge of narrow, trendy courses. George Leef calls it a bad case of “credentialitis”. That is, young Americans now go to college just for whatever “access” their credentials will provide, not because they want to learn anything or because they want to acquire useful skills. Credentialitis wastes resources, burdens taxpayers, leaves many students struggling with debt, but does nothing to improve our productivity or competitiveness. The federal government is overly involved. Leef believes the solution is for the federal government to downsize its role. That’s certainly not the current trend, where a newly introduced Student Aid Bill of Rights guarantees the “resources needed to pay for college” for everyone. George Leef, “What Has Federal Higher Ed Policy Given Us? A Bad Case Of Credentialitis”, Forbes, March 17, 2015. The most highly educated generation in the United States compares poorly with international peers in literacy and numeracy skills. Despite having the highest levels of educational attainment of any previous generation, America’s millennials, on average, demonstrate weak skills in literacy, numeracy and problem solving in technology-rich environments compared to their international peers. This finding from a new study by Educational Testing Service (ETS) raises the question of whether we can thrive as a nation when a large segment of our society lacks the skills required for higher-level employment and meaningful engagement in our democracy. America’s Skills Challenge: Millennials and the Future uses data from the Programme for the International Assessment of Adult Competencies (PIAAC) to compare the U.S. to 21 other member countries in the Organisation for Economic Cooperation and Development (OECD). The report focuses on young adults born after 1980 who were 16–34 years of age at the time of the assessment. PIAAC measured adult skills across three domains: literacy, numeracy and problem solving in a technology-rich environment (PS-TRE). They also compare poorly with earlier generations in the U.S.
… Equally troubling is that these findings represent a decrease in literacy and numeracy skills when compared to results from previous years of U.S. adult surveys. As a country, simply providing more education may not be the answer. There needs to be a greater focus on skills — not just educational attainment — or we are likely to experience adverse consequences that could undermine the fabric of our democracy and community. Even the best and the brightest in the U.S. compare poorly with their international peers. Additionally, the data reveal that even our best performing and most educated millennials, those who are native born, and those with the greatest economic advantage in relative terms, do not perform favorably in comparison to their peers internationally. In fact, in numeracy, the U.S.’s top performing millennials scored lower than top-performing millennials in 15 of the 22 participating countries, indicating that the skills challenge is systemic. Low-scoring U.S. millennials ranked last and scored lower than their peers in 19 participating countries. Have we misplaced our “faith in more years of schooling, degrees, credentials, and certificates”? Most troubling is that our faith in more years of schooling, degrees, credentials, and certificates to produce better outcomes is vividly shown to be misplaced. More time in school is not producing Americans with more or better skills. The people who will work, earn, support families, create jobs, make policy, take leadership positions, and be entrusted generally with protecting, defending, and continuing our democracy are less prepared to do so than any generation in American history. More young people are living in poverty and fewer have jobs compared their parents’ generation, the Baby Boomers, in 1980. Even though a higher percentage of today’s young people have college degrees, more live in poverty. Madeline J. Goodman, Anita M. Sands, Richard J. Coley, America’s Skills Challenge: Millennials and the Future, Educational Testing Service, February 2015. The higher education downsizing trend hits Sweet Briar College. Sweet Briar College announced Tuesday that it is shutting down at the end of this academic year. This closure “stunned many in higher education”. Small colleges close or merge from time to time, more frequently since the economic downturn started in 2008. But the move is unusual in that Sweet Briar still has a meaningful endowment, regional accreditation and some well-respected programs. But college officials said that the trend lines were too unfavorable, and that efforts to consider different strategies didn’t yield any viable options. So the college decided to close now, with some sense of order, rather than drag out the process for several more years, as it could have done. The future looked bleak for Sweet Briar, consistent with Moody’s dire predictions of a higher education “death spiral” that is considered “particularly acute at small, mid-tier private’ colleges“. Sweet Briar officials cited overarching challenges that the college has been unable to handle: the lack of interest from female high school students in attending a women’s college like Sweet Briar, declining interest in liberal arts colleges generally, and eroding interest in attending colleges in rural areas. Sweet Briar is in the foothills of the Blue Ridge Mountains in Virginia. “We are 30 minutes from a Starbucks,” said James F. Jones Jr., president of the college. Families have a “declining interest” in paying big bucks for a lower-tier college education. The annual cost of attending Sweet Briar College was $51,000 in 2013-14. However, the school’s average discount on tuition had grown to 62%. That was clearly unsustainable. Students have the option to move to Piedmont with assured admittance and continue their education at a discounted price, but the merger effectively means that come May 1, Tennessee Temple University will no longer exist. Scott Jaschik, “Shocking Decision at Sweet Briar”, Inside Higher Ed, March 4, 2015. 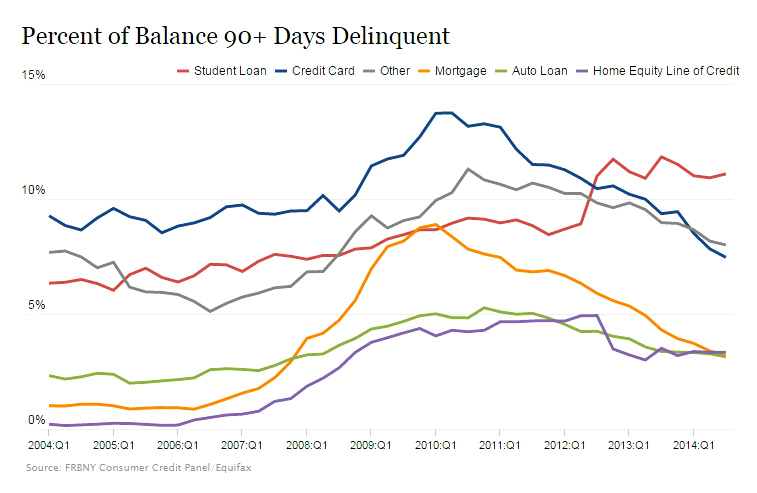 Americans are having more trouble paying off their student loans than their mortgages or any other type of debt. 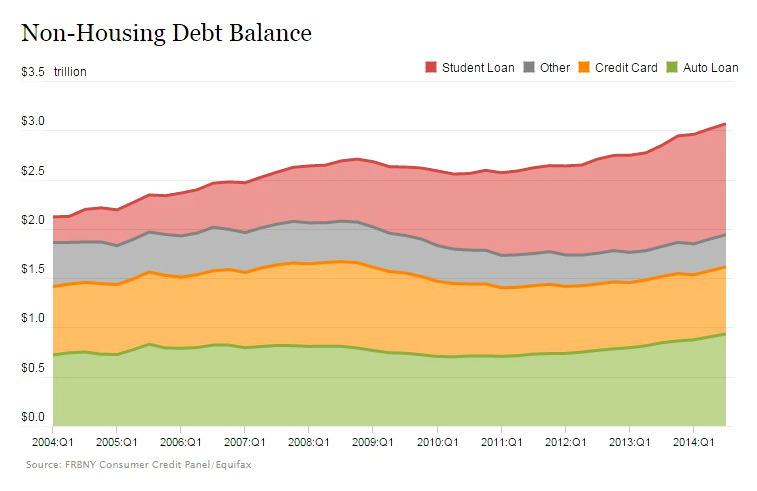 As student debt balances continue to grow . . .
. . . student loan defaults have overtaken those for all other types of debt. 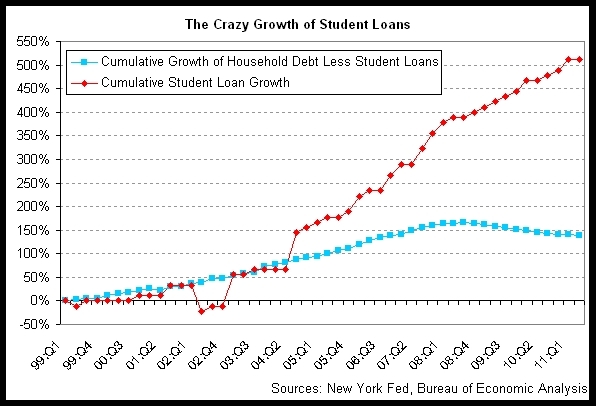 The number of student borrowers almost doubled over ten years. The surge is fueled by more people borrowing — and borrowing larger amounts. The number of borrowers rose 92 percent between 2004 and 2014, according to the Fed researchers. The average student loan balance grew 74 percent. Danielle Paquette, “Americans are having more trouble paying off their student debt than their houses”, Washington Post, February 19, 2015. Are we seeing a ‘big quasi-bailout’ for student loan borrowers? The Obama administration projects that the increased use of student loan forgiveness programs will cost taxpayers $22 billion next year. … Primarily because of the recent growth in enrollment in the program, projected long-term revenues from the federal direct student loan portfolio were reduced by almost $22 billion compared with the best guess from the previous year…. That’s a big quasi-bailout, increasing the deficit nearly 5 percent. The White House budget office was unaware of any larger re-estimates since the current scoring rules for credit programs went into effect in 1992. As a January Politico Magazine feature on the government’s unusual credit portfolio reported, the Federal Housing Administration has stuck more than $75 billion worth of similar re-estimates onto Uncle Sam’s tab over the last two decades, most of them after the recent housing bust led to a cascade of FHA-backed mortgage defaults. But it’s never had a one-year shortfall quite as drastic as this. Borrowers are made out to be innocent victims of “circumstances beyond their control”. Regardless of which accounting method is used, the federal government is expecting to write off billions of dollars in future student loan balances under the program in order to reward public service employment and protect borrowers from economic circumstances beyond their control. It’s not as if a student loan bailout should come as a surprise. Here’s a question from 2011. Is a student loan bailout inevitable? Seeing the trend lines, Mark Gimein wrote this four years ago. Eventually both private lenders and the government will be on the hook. The government has already moved to ease some loan terms. It will need to find more, especially for those snookered into paying for degrees worthless in the job market. The private loans, meanwhile, will simply blow up. We may as well start figuring now how graduates, taxpayers, lenders, and schools will split the bill. Taxpayers just took on $22 billion, and there’s probably more to come. Kevin Carey, “Flip Side of Reducing Student Debt Is Increasing the Federal Deficit”, New York Times, February 10, 2015. Michael Grunwald, “The College Loan Bombshell Hidden in the Budget”, Politico, February 05, 2015. Is this how most college degrees will be earned in the future? … Emina Dedic of HackCollege used standardized tests to save a ton of money and get two degrees a year earlier than she would’ve otherwise. After several years of going the traditional college route, Dedic found herself struggling financially. In her research for options she “stumbled upon the concept of testing out of a degree”. In the beginning, I was skeptical. I hadn’t heard of anyone in my day to day life who had used this method. I thought it was too good to be true, but after further investigation, I quickly realized this was a legitimate way to get college credit and speed up the graduation process. I managed to take over 30 tests, for three college credits per class, each test costing me about 129 after administrative fees. Using the test-out method, I was able to obtain my AS in General Studies and BS in Psychology within the span of a year. She mainly used DSST (DANTES Subject Standardized Tests) and CLEP (College Level Examination Program) exams to earn enough credits to get her degree in psychology from Charter Oak State College in New Britain, Connecticut. This non-traditional school offering online courses is not prestigious by any stretch of the imagination, but their alumni page shows that graduates have gone on to get advanced degrees from institutions like Harvard and Quinnipiac University. Dedic appears to be an ambitious person whose next move is teaching English overseas. While her career path may take twists and turns instead of leading directly to a secure, well-paying job, that is also true for many graduates of traditional colleges who paid much more for their degrees. And whether it’s AP or CLEP, most colleges allow students to save time and money by testing out of some courses. Considering the limited amount of learning that goes on at college these days, this emphasis on credentialing may realistically be the best option for many students. Tori Reid, “Ask Your Advisor How to Test Out of Classes and Get Your Degree Early”, Lifehacker, 12/31/14. Emina Dedic, “How to Test Out and Get Your Degree Early”, HackCollege, 12/23/14. Federal student loans have climbed sharply every year since 2007. 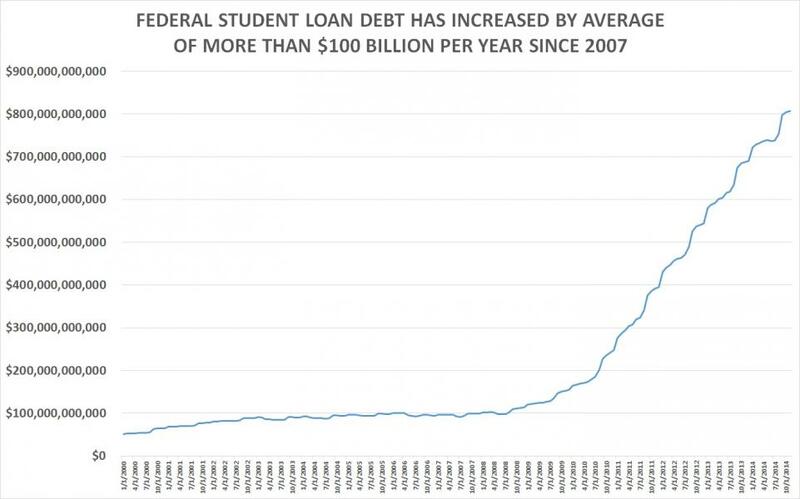 From November 2013 through November 2014, the aggregate balance in the federal direct student loan program–as reported by the Monthly Treasury Statement–rose from $687,149,000,000 to $806,561,000,000, a one-year jump of $119,412,000,000. The balance on all student loans, including those from private sources, exceeded a trillion dollars as of the end of the third quarter, according to the Federal Reserve Bank of New York. The steep rise starting in 2010 can be partly explained by the elimination of the Federal Family Education Loan (FFEL) program, which allowed private lenders to make federally guaranteed student loans. In 2010, Congress passed and the President signed into law a bill that eliminated the FFEL program for all new loans made as of July 1, 2010. All federal student loans have been made under the Direct Loan program as of that date…. The federal government now “essentially serves as the banker — it provides the loans to students and their families using federal capital (i.e., funds from the U.S. Treasury), and it owns the loans,. The federal student loan program serves as a transfer of wealth to colleges and universities. Rich schools like Harvard enjoy rising endowments while their students receive federal loans. By doling out a net average of about $100 billion per year in student loans, the federal government allows even the nation’s wealthiest universities to charge students more than they and their families can pay without going into debt. That makes colleges richer and students poorer. Students benefit from taxpayer-funded loan forgiveness programs. “Currently, over 50 loan forgiveness and loan repayment programs are authorized, and at least 30 of which were operational as of October 1, 2013,” says CRS. When the government forgives or repays a student loan, it becomes a redistribution of wealth from taxpayers to a person who attended college. Terence P. Jeffrey, “Federal Student Loan Debt Tops $800 Billion”, CNS News, December 31, 2014. How will the new federal college rating system affect higher education? Beginning next year, colleges and universities will be judged on three broad criteria when it comes to meting out federal financial aid: access, affordability and student outcomes, according to a new “framework” released by the Education Department. Public input on the new framework will be accepted until February 17. Schools could be rated on a sliding scale, from “high performers” to “in the middle” to “low performers,” based on such indicators as whether they meet a certain average net price, graduation and student loan repayment rates, and whether graduates get a job in the field they studied. Measuring employment outcomes can be complicated. One of the most controversial ideas that’s been debated is some kind of jobs measure. This framework includes two different examples: What percentage of students have a job, say, six months after graduation? And what are their median earnings long-term? The administration says it will collect and present this labor market information in a way that is “sensitive to educational, career, work force and other variables.” In other words, a divinity school won’t be dinged because its graduates are pastors with low salaries. Two other possibilities on the list for outcomes are grad-school attendance rates, and loan-repayment rates. That last metric has already been put into place as the “gainful employment rule” for for-profit colleges, which are suing to stop it. What are the chances that once the metrics are in place, schools will try to find ways to game the system? For example, will they push students to enroll in graduate school so they can be put into the “successful outcome” category? Will standards for graduation decline? Scott Neuman, “Education Dept. Issues Framework For New College Rating System”, NPR, December 19, 2014. Anya Kamentz, “New Federal College Ratings Will Consider Aid, Total Cost, Employment”, NPR, December 19, 2014. A Marshall Plan for higher education? In consideration of “the sky-high unemployment rate of recent graduates” and soaring student debt levels fueld by clueless students, Victor Davis Hanson proposes a Marshall Plan for higher education. … There should be a Marshall Plan on campuses to advise and help students in their second and third years about post-graduate employment. Financial counselors should warn students when their tuition debt reaches unsustainable levels. One would think university counselors early on would mandate consultations with students on job preparation, faculty would mentor students about job opportunities, and in general the employment rates of recent graduates would be well-publicized. What sort of business hikes its charges while lowering the quality of its product? Answer: one that is subsidized by the government. Whoa! If expansive government intervention is considered detrimental, then a Marshall Plan seems like overkill as an attempt to help solve today’s problems in higher education. Although the Marshall Plan may be favorably viewed by most people, a credible counter argument is that its sterling reputation is in fact “a modern myth”. Moreover, receipt of aid did not track with economic recovery. France, Germany and Italy began to grow before the onset of the Marshall Plan, while Austria and Greece expanded slowly until near the program’s end. Great Britain, the largest aid recipient, performed most poorly. Far more important for Europe’s growth was policy reform…. The Marshall Plan may have been a generous act, but that doesn’t mean it spurred Europe’s recovery. The real lesson of the Marshall Plan is that entrepreneurial culture, legal stability and free markets are necessary for economic success. Liberty, not money, is the key to prosperity. In which case the better solution may be for the government to take a smaller role in helping finance college. Maybe growing subsidies are actually hurting the low-income students they are intended to help. It’s not just that many colleges and universities are bleeding taxpayers. The government’s overall strategy to subsidize higher education is failing at its core task: providing less privileged Americans with a real shot at a college degree. Alarmingly, it is burdening low-income students with risks they cannot bear and steering them into low-quality educations. A Marshall Plan initiative for today’s college woes could easily become a bureaucratic, costly fiasco with unintended consequences that cause more harm than good. Victor Davis Hanson, “The Campus as California”, PJ Media, December 14, 2014.